Turning vision into reality will never get old, especially for a small nonprofit with a tiny budget and a design intern trying to find her way in the design world. 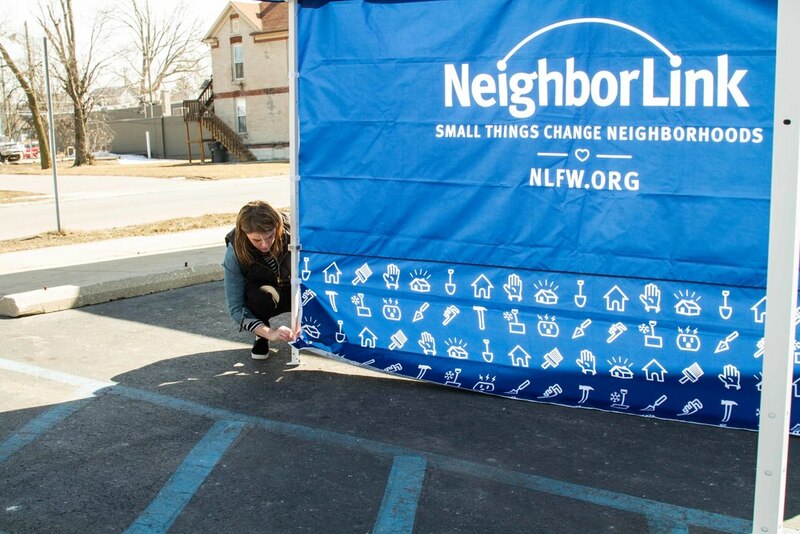 Lily Fenoglio has been working so hard getting all our Team NeighborLink cycling, triathlon, running, and a ton of small accessory projects done in the past couple of weeks, including this tent, backdrop, and the soon to be in table top cover. I'm really glad that this project came together and was delivered before her time was up towards the end of March. Well done, Lily. You've made us look dynamite. Also, EZ-UP, did an incredible job on the production of the tent. Their customer service is top notch and the quality of their tent really surprised me. The graphics are crisp, the materials are definitely what you'd expect for a product that will be abused over the years, and their turnaround time was quick. EZ-UP helped us a bit through a nonprofit discount, but I share this because we really are impressed. We think they're worth every dime. Our goal is to be a whole lot more visible in 2015, so keep an eye out and come say hello if you see us.